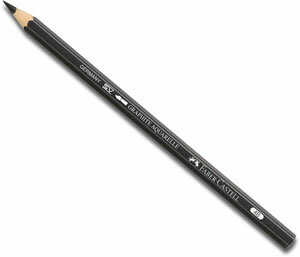 Faber Castell have produced the ideal tool for both preliminary sketches for watercolour drawing and complete watercolour techniques in graphite. The pigment dissolves on being brushed with water. The 3.3mm core is made of extra break-resistant SV bonded leads which is available in 5 grades of HB, 2B, 4B, 6B, 8B. Faber Castell have produced the ideal tool for both preliminary sketches for watercolour drawing and complete watercolour techniques in graphite. The pigment dissolves on being brushed with water.